UPDATE: The official Xbox store product page for Crackdown 3 just went live. Looks like something could be happening. ORIGINAL STORY: For the longest time, we’ve been waiting (tirelessly) for Microsoft’s latest entry in the Crackdown series, which was announced years ago but consistently delayed to get its development up to speed. And while we wait to see what gets announced for Crackdown 3 during this Saturday’s X018 event, it appears that a new name has appeared online, suggesting that the game now has a co-title. 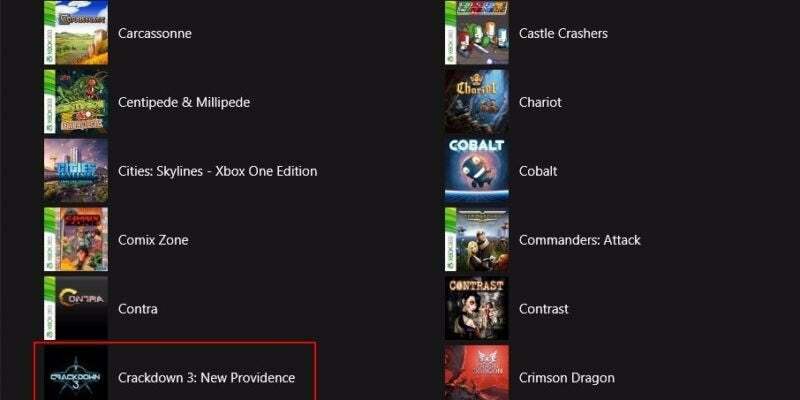 A Reddit user recently came across a new listing for the title through the Italian Xbox Store, in which the game is now called Crackdown 3: New Providence. It appears that it’s keeping its general sequel name intact, but could be telling a new story with a specific location mentioned within it. You can see the listing for yourself below. Microsoft hasn’t said a word about the game in months, though Xbox head Phil Spencer had said that its development was moving along just fine. So it looks like this Saturday’s presentation will finally give us an idea of when it’s coming our way. And some other hints have noted that it won’t be long. First off, a new rating has appeared over at the Australian Classification Board, with a rating of MA 15+ for strong violence, and a note of online interactivity -- which means we’ll be getting full-on interaction with fellow “agents.” And ratings like this aren’t usually issued until the game is very close to release, which means its February 2019 release window might not be too far off. In fact, dare we say we’ll get it even sooner? Nah. We’ll see what Crackdown 3 news drops in just a couple of days! Crackdown 3 is set to release for Xbox One, Xbox One X and PC in February 2019.